The novel material graphene makes faster electronics possible. Scientists at the Faculty of Electrical Engineering and Information Technology at the Vienna University of Technology (TU Vienna) developed light-detectors made of graphene and analyzed their astonishing properties. High hopes are pinned on this new material: Graphene, a honeycomb-like carbon structure, made of only one layer of atoms, exhibits remarkable properties. In 2010, the Nobel Prize was awarded for the discovery of graphene and its behavior. At the Photonics Institute at the TU Vienna, the electronic and optical properties of graphene are the focus of interest. Viennese scientists could now demonstrate how remarkably fast graphene converts light pulses into electrical signals. This could considerably improve date exchange between computers. When data is transmitted by light pulses (for instance in fiber optic cables) the pulses have to be converted back into electrical signals, which can be processed by a computer. This conversion of light into electrical current is possible due to the photoelectric effect, which was originally explained by Albert Einstein. In certain materials, light can cause electrons to leave their positions and travel through the material freely, whereby electrical current occurs. Light detectors which convert light into electronic signals have been around for a long time. But when they are made of graphene, they react faster than most other materials could, Alexander Urich explains. He investigated the optical and electronic properties of graphene together with Thomas Müller and Professor Karl Unterrainer at TU Vienna. The scientists had already shown last year that graphene can convert light into electronic signals with remarkable speed. However, the reaction time of the material could not be determined  the photoelectric effect in graphene is so fast that it just cannot be measured by the usual measuring methods. 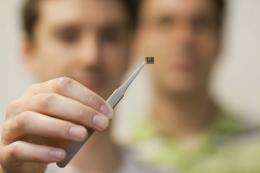 But now, sophisticated technological tricks could shed some light on the properties of graphene. At TU Vienna, laser pulses were fired at the graphene photo-detector in quick succession, and the resulting photo-current was measured. If the time delay between the laser pulses is changed, the detectors maximum frequency can be determined. Using this method we could show that our detectors can be used up to a frequency of 262 GHz, Thomas Müller (TU Vienna) says. This corresponds to a theoretical upper bound for data transfer using graphene photo-detectors of more than 30 gigabytes per second. It has yet to be determined to what extent this is technically feasible, but this result clearly shows the remarkable capability of graphene and its potential for optoelectronic applications. 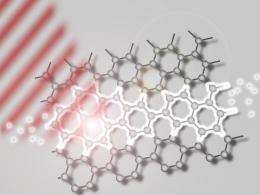 The main reason for the fact that graphene-photodetectors can operate at such high frequencies is the short life-span of the charge carriers in graphene. The electrons which are removed from their fixed position and contribute to the electrical current settle down at another fixed position after a few picoseconds (millionths of a billionth of a second, 10-12 seconds). As soon as this happens, the graphene photodetector is ready for another light signal which frees new electrons, creating the next electrical signal. The fast reaction time of graphene is one more item on the list of remarkable properties of this material. In graphene, charge carriers can travel extremely far without being disturbed. It can absorb light in a huge spectral range, from infrared to visible light  unlike standard semiconductors, which can only absorb a small part of the spectrum. In addition to this, graphene can conduct heat extremely well and has an exceptionally high breaking strength.